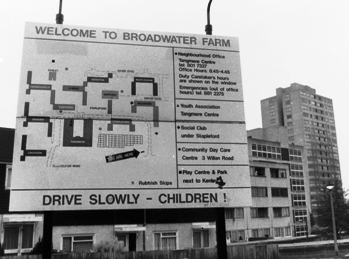 The riots and disturbances of the last few days in English cities had me casting my mind back to the 1985 Broadwater Farm riot, thinking of the similarities between the circumstances, and recalling my own slightly surreal experience of policing on that estate. The spark that led to the initial disturbances in both cases was a death for which Tottenham residents blamed police. This week, it was the shooting of a young man, reportedly a drug dealer, who was originally said to have fired first. This now seems not to have been the case, leading to local protests which escalated and, ultimately, sparked lawlessness in many other urban areas. In 1985, it was the death of a middle-aged woman during a house search, after her son had been arrested on a minor matter involving a car tax disk. Just as this week, protests led to wider disturbances. The defining incident in 1985 came with a second death, the brutal killing of police officer Keith Blakelock. Both times, the disturbances kicked off on the Broadwater Farm estate. Both involved a death which was perceived as being the result of aggressive policing. Both times the initial protests were poorly managed, leading to frustration which vented itself in violence. Then, as now, a Conservative government was hell-bent on cutting public services to save a few pounds. Then, as now, police powers were being extended and police accountability seemed to be disappearing. Then, as now, the divisions between the haves and have-nots in society were becoming ever more visible. A few days after the 1985 riot, I was sent in to report on its aftermath in the context of the built environment. 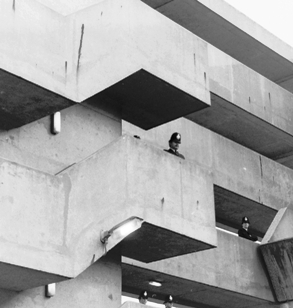 Broadwater Farm was already notorious as a particularly soulless example of 1960s brutalist architecture, and had by the 80s become a modern ghetto. The first thing I noticed was how empty the place was. The estate had a large number of large buildings and a seriously high density of population, yet there was nobody about. I wanted to find some residents, to talk to them about what it was like living there, but there was hardly anybody outdoors. Even the estate’s general store was deserted, and the manager unwilling to speak to me, so I resolved to knock on a few doors and hope for the best. It was then that I realised just how many pairs of eyes were following me. 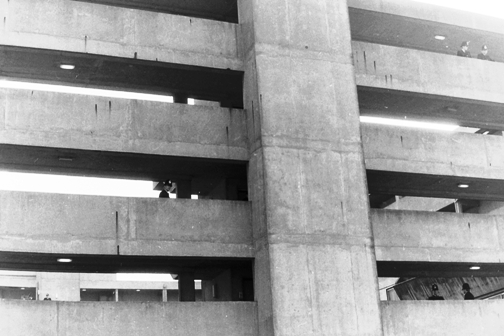 Coming out from the shop, at the base of the infamous Tangmere block, the view ahead was of a stack of multi-level elevated walkways with a central zigzag staircase. On each side of each of the five levels, a pair of uniformed officers stood facing me. Thinking this would make an interesting picture, I raised my trusty OM-10 to my eye and was astonished to see all the officers disappear. It was a synchronised move, clearly deliberate, and clearly a reaction to the camera. I put the camera down, and the officers re-appeared. I brought it to my eye, and again they sidestepped into the shadows. I had been aware of being watched, almost from the moment I’d entered the estate. While there were hardly any civilians to be seen, the area was heavily policed and I’d taken a few photographs with uniformed officers – always in pairs – against the backdrop of the stained hard-edged concrete structures. As a young reporter, alone, in a known trouble spot and carrying an expensive camera (my own property), I was actually quite reassured by the police presence. But this choreographed display was chilling, and I’ll admit to being a little creeped-out by it. I never got the picture I really wanted, of a couple of dozen police officers silhouetted against the backdrop of the brutalist structures of the Farm, but I did manage to grab one or two shots snatched from hip level. This was long before the days of digital photography, and film was expensive. I now notice that I shot just a single roll of Ilford HP5 that day (more remarkable is that I was able to find it again, so many years later). The cat and mouse game continued, and the hovering uniforms made it harder than usual to find interviewees, but as the light faded that October afternoon I finally got the quotes I needed for my article (I think it was for Local Government News, but it might have been Building, or Contract Journal) and made my way home. The article itself is long forgotten, but the sight of two dozen police officers repeatedly sidestepping out of shot is something I will never forget.